Embark on an interesting journey and be amazed by the many challenges the railroad has faced over time and enjoy the many different shapes that trains have had through the ages. From the ancient coal-fired versions, that powered through the landscapes in a cloud of steam and smoke to the modern streamlined models that look like rockets on rails. 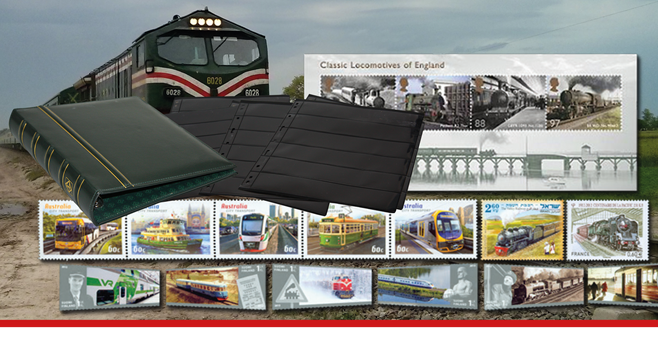 Approximately once a month you will receive hand selected stamps with trains for around € 15. With the second shipment you will also receive a beautiful green Leuchtturm Classic leatherette album with stock cards. Special price for the album and two packets of sheets is only € 17 – an optimal setting for your thematic collection.